Week 5 is the week in which bye weeks start and IDP owners begin looking for that one week fill-in to keep their fantasy rosters afloat. With the Dolphins, Ravens, Browns, Cowboys, Redskins, and Rams all on bye this week, teams will be without IDP studs such as Ray Lewis, Sean Lee, DeMarcus Ware, D'Qwell Jackson, and James Laurinaitis. The waiver wire selections below should provide owners with a wide array of suitable fill-ins for any of their regular IDP starters who are on bye or have been stricken by the injury bug. 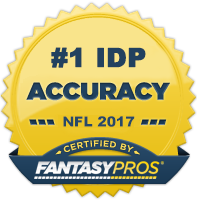 Barrett Ruud and Paul Posluszny both had bounce back games and gave owners a glimmer of hope for their future IDP value. Call me a skeptic, but I'm not buying their performances. Both players (especially Posluszny) were recipients of a high number of tackle opportunities. Also, Ruud admitted last week for the first time that his shoulder is likely to bother him all season and that he plans to just play threw it. Consider Ruud nothing more than a LB4 moving forward and Posluszny an LB3 with upside in good matchup situations. David Hawthorne had another solid tackle outing and seems to have course-corrected himself onto the right path. He's looking more and more healthy on the field and with Matt McCoy likely out for an extended period with a "serious knee injury," Hawthorne is again shaping up to be an every down LB2+ with top 10 upside. I recommended Dashon Goldson as a waiver wire pickup last week and he busted out with 10 solo tackles against the Eagles in week 5. I have to admit, even I didn't expect those type of tackle numbers. Donte Whitner was out of the game which left Goldson with more tackle opportunity than he will normally get. He's playing behind two very solid linebackers in Patrick Willis and Navorro Bowman and is likely to be a bit sporadic with his tackle numbers. Ultimately, his overall value will be determined by his ability to make big plays. I stand by what I said last week in that Goldson is a DB4 with nice upside. Lawrence Timmons continues to put up dumbfounding numbers. He had just two total tackles against the Texans last week after receiving a good amount of tackle opportunity. His level of intensity on the field seems to have diminished this season. I don't recommend selling him quite yet though as he still has the potential to explode at any time, but the season is starting to wear long and owners have to be willing to cut big name players who aren't producing, especially if there are still viable replacements left on the waiver wire. Ryan Kerrigan continues to impress as he totaled his third straight sack in as many weeks. He is on bye this week, but should make for a nice LB2/3 option in big play leagues after he returns from his bye. Trent Cole has a Grade 2 muscle strain which will likely sideline him for three weeks. This is a striking blow to fantasy owners as Cole is a top 3 fantasy linemen and is near impossible to equally replace. RDE Derrick Morgan (TEN) - Morgan was one of the more NFL-ready defensive ends to come out of the 2010 draft and, if not for a season-ending injury early last season, he could have established himself as one of the premier up and coming pass rushers. Now fully healthy, Morgan is starting to build some traction with two sacks in his last three games. He has a good chance to add to that sack total this week against Big Ben and the Pittsburgh Steelers who have given up the 5th most sacks in the NFL. Consider him a low-end LB2 option this week and a must add in deep dynasty leagues. LDE Cliff Avril (DET) - Granted Avril hasn't produced nearly as expected so far this season, but it only takes one game for a lineman to jump back into the top 30. This could very well be that game for Mr. Avril. Even though the Bears only gave up 1 sack last week, you have to factor in that they only threw the ball 17 times. Their offensive line is still atrocious and amongst one of the worst in the NFL. To top it off, starting right tackle Gabe Carimi will be out this week and Avril will be going up against Frank Omiyale. Avril is likely available in most leagues and has a good chance for breakout game this week. He's worth the risk if you are struggling to fill that DL2/3 spot. LDE Antonio Smith (HOU) - Even though he's had a sack in four straight games, Smith is flying under the radar in the majority of leagues due to his low tackle numbers. He draws the Raiders this week who have given up a league low 2 sacks in large part to their propensity in running the ball a high percentage of the time and is therefore not a great option in week 5. But for those in deeper big play leagues, Smith has some DB3 value down the stretch. LDE Adrian Clayborn - Out of all the rookie defensive ends in this year's draft class, Clayborn was perhaps most ready to make an immediate fantasy impact. After opening the season with two straight weeks of zero production, he completely fall off the radar of most owners even in deeper leagues. He's bounced back with a sack in his of his last two games however and has a top 5 matchup against the 49ers this week. He's worth a look as a last resort DL3. SILB Jovan Belcher (KC) - The Chiefs have been using Belcher in subpackages the last two games and his increased snap count has had a direct positive impact on his tackle numbers. Last week Belcher posted 10 total tackles followed by 7 total tackles this week. As long as the Chiefs continue to use him as an every down linebacker, he will have LB3 value. WILB Gary Guyton (NE) - It looks as though Jerod Mayo's MCL strain could sideline him for several weeks. Gary Guyton will replace him at the WLB position and has a favorable chance in becoming an every down linebacker. The Patriots may elect to use Brandon Spikes in nickel packages, but Spikes has struggled in pass defense and therefore will likely remain a two down linebacker. Teams have been throwing on the Pats a ton which has limited the tackle opportunities for the linebackers, but assuming Guyton gets an every down role, he has low-end LB3 value with some upside. WLB Leroy Hill (SEA) - The Seahawks linebacking crew has been shuffled around a tremendous amount already in the young season. In the midst of all this rearranging, Leroy Hill has become an every down linebacker on the strong side. Since assuming a three down role, he posted 20 total tackles in two games. The Seahawks aren't lighting the world on fire on offense, so Hill should continue to see an above average amount of tackle opportunities throughout the season. With David Hawthorne and Kam Chancellor sucking up a majority of the tackles, Hill's ceiling becomes quite limited. However, there are still enough tackles to go around to make Hill a LB3 bye week filler for those in deeper IDP leagues. WLB Kavell Conner (IND) - I mentioned Conner in my 2011 IDP Draft Guide as a deep sleeper. He's not overly talented by any means, but he does play on the weak side in a scheme that still incorporates a lot of Cover 2 principles that tend to funnel the ballcarrier towards that side of the field. Additionally, the Colts defense figures to be on the field perhaps more than any other defense in the league this year. Even though Conner's solo tackle numbers (26) aren't top notch, he's had an absurd amount of assists (19) thanks to a very generous Indianapolis scorekeeper. As long as he continues to play in all the subpackages, Conner is a sneaky LB3+ play. WLB Thomas Howard (CIN) - Howard is usually good for 6-8 total tackles per game (high floor/low ceiling type of player) and should produce at the high end of his potential this week against the run-heavy Jaguars who have become one of the better matchups for opposing fantasy linebackers. If you just need a safe pick to lock into your LB3/4 spot, Howard makes for a nice option in deeper leagues. SS Charles Godfrey (CAR) - With both Thomas Davis and Jon Beason gone for the year, the Panthers have had to resort to starting two linebackers in Dan Connor and Jason Williams who have minimal NFL experience. The result has been that teams are starting to run all over Carolina and easily reach the second level of the defense, which means more tackle opportunities for Godfrey. He had 5 tackles (4 solos) and an INT against a poor Bears matchup last week and gets one of the more favorable matchups in the Saints this week. You should feel confident in starting Godfrey as a DB2 in week 5. SS Yeremiah Bell (MIA) - I never thought Yeremiah Bell would be on one of my weekly waiver wire lists, but due to his slow start, many IDP owners in shallower leagues decided to cut Bell last week. What a dreadful mistake as Bell racked up 14 solo tackles against the Chargers. I've been recommending Bell as a buy low candidate over the last two weeks and hopefully some readers heeded my advice. If not, and you're lucky enough to have him sitting on your waiver wire, go out and grab him as he has the same top 10 potential he has had in previous years, especially in tackle-heavy leagues. FS Reggie Nelson (CIN) - The Cincinnati safety positions have been very productive from a fantasy standpoint. The main issue was there rarely were players that stayed in the position long enough to put up solid numbers week in and week out over the course of the entire season. Nelson could very well buck that trend this year, however. He's had 3 solid games out of four so far this season and is starting to establish himself as a very solid DB3 option. SS Jordan Babineaux (TEN) - I mentioned Babineaux last week as a one week filler and he paid huge dividends for owners as he had 6 total tackles and an interception that went to paydirt. News recently broke that Chris Hope is likely out 4-6 weeks with a broken arm which makes Babineaux a nice DB3 pickup for the foreseeable future.